RIO LINDA, Calif. — Ciara Villegas is still in the hospital. 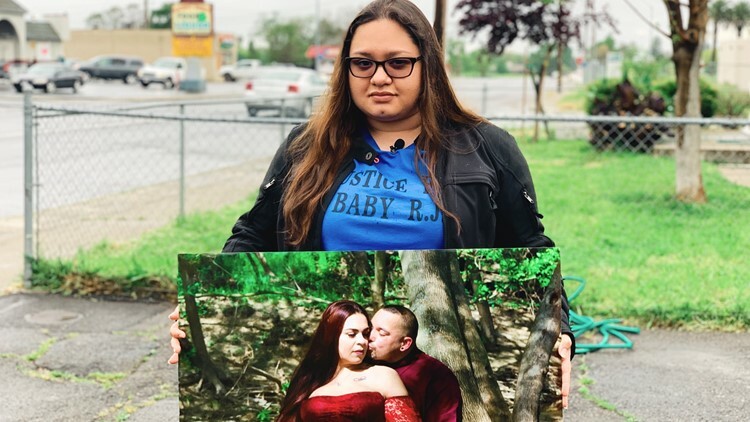 Last week, the Villegas was standing in front of her family's Rio Linda home when she was struck by 24-year-old Ronnie Ward III, a suspected impaired driver. Villegas was six months pregnant. The 31-year-old was rushed to the hospital in critical condition and had to have an emergency C-section so that doctors could try to save her baby's life. The baby, who she named RJ, died two days later. "I'm glad my sister got to see him and hold him," Villegas' sister, Mercedes Villegas, told ABC10. "We're very thankful for that, but it was hard to know it was her first and last time to see and hold her baby." Mercedes Villegas holds a photo of her sister Ciara who is still in the hospital. Villegas' family held a vigil Monday night in Rio Linda to honor the baby — to try and heal and reflect on a night that went awry. "She pulled up here at my mom's and coming to get milk and going across the street to buy milk for my little sister," Villegas' sister, Mercedes Villegas, told ABC10. "She had just stepped out of the car and shut the door." The vigil was held nearly exactly one week to the hour after the accident. The family is also demanding justice against the driver. Since the accident, many have questioned why the driver hasn't been charged sooner, or at all. Defense Attorney John Campanella told ABC10 the legal process in DUI cases can be long and arduous. "It's looking between 10-12 days on average to get a blood analysis done," Campanella told ABC10 last week. "Of course, it could be shorter, it could be longer. I personally had cases where it's been a month since the sample has been analyzed." The Sacramento County District Attorney's office said no charges have been filed against the driver as of Monday. Ward was supposed to appear in court next week, but the case has been rejected for now. "Half of me [is] mourning my nephew that we've been waiting and planning for months, and another half of me is breaking because I'm watching my sister in pain everyday," Villegas said. Follow the conversation on Facebook with Ananda. A family is searching for answers after a suspected DUI driver involved has yet to be charged following a deadly accident in Rio Linda on Monday. Defense attorney John Campanella sat down with ABC10 to discuss the different facets and legal processes of a DUI case.